Spring is coming. Really. Even if you're still bundled up, you're desperate to put away your snow shovel, and you're watching your heating bills soar because a polar vortex has parked itself in your back yard. Even so. It's a sure sign that spring is coming when potholes appear everywhere on the roads. You can learn all about how potholes are born at this site, which includes nice graphics and a short video. While it's below-freezing temperatures that start the process of pothole making, it is after the thaw that the potholes actually form, and get to work putting dents into your wheels, sometimes the underside of your car, and always, ultimately, your checkbook. The other day I was riding with a friend who drove his Jeep, at highway speed, through a pothole that must have been nearly two feet wide and at least eight inches deep. I'm not sure my brave Golf would have survived that pothole. As for the Jeep, the physical rattling reverberated in that car for quite a while afterwards, and my friend's cursing for much longer. But while a new set of shock absorbers can set you back by hundreds of dollars, safety is a bigger issue around potholes. They are a real menace to motorcycle riders. Even in a car, swerving to avoid them can easily get you into the next lane, which is a real problem if the next lane happens to be the only other lane on the road: the one with the oncoming traffic. It is in the springtime that I see a lot of weaving on the road, especially by high-end cars that tend to get equiped with larger wheels: those have lower tire walls and are more easily dented. Here's the secret: Roadways with surfaces that can't chip off don't have potholes. I'm talking about roads and streets paved with brick, stone or belgian block. Such road surfaces don't melt and buckle in extreme heat, and they don't get dissolved by contact with clayground either. 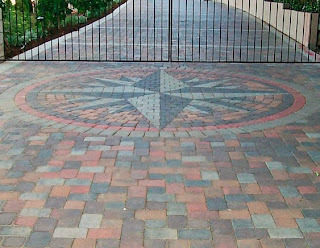 There are many other advantages to stepping away from asphalt and going with brick or stone pavers. Quite apart from the sheer artistic creativity the medium offers. Brick pavers are sintered to extreme hardness. 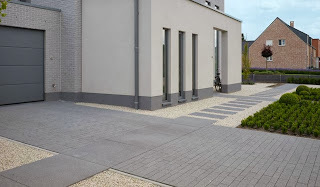 Stone pavers are even harder, and will withstand large volumes of traffic for a long time: just think of all those old European downtowns which have been paved with stones for hundreds of years. My parents' street was re-paved forty years after its initial construction, and only because the growing roots of trees had started to make the road surface buckle. The vast majority of bricks were re-used. Compare that to an asphalt road, which needs to be re-surfaced every ten years or so. A brick-paved road can be repaired in patches. In contrast, it is nearly impossible to patch an asphalt surface, because the seams invariably attracts ice formation and the start of a crack or pothole. Repairing an asphalt road surface properly requires doing all of it, usually with very large machinery. If you change your mind about the layout of your street, you can re-lay the separation lines with bricks of a different colour, without the need to tear up the rest of the surface. This is very handy during road construction, if you need to divert traffic temporarily while you're, say, laying light rail, or installing fiber optic cables below the street surface. You can make handicapped parking spaces appear and disappear according to the needs to the streets' residents. The spaces between the bricks or stones make the road surface naturally self-draining: Such a porous road suface allows rainwater to penetrate the soil underneat, partially relieves storm drains from runoff and helps to prevent flooding of waterways. Those same spaces act as expansion joints, so that the road surface stays flat even at extremely high temperatures. need not get very hot in the first place. (Try it: in the mid-afternoon of a sunny day, feel the surface of an asphalt-covered road, and compare that to the surface of the lighter-coloured concrete pavement on the side of the same road). This can reduce the urban heat island effect significantly. The one advantage that asphalt road surfaces may have, the quieter ride, may not even be an advantage for long: as cars running on internal combustion engines get phased out in favour of eerily quiet electric cars, a noisier road surface will actually help you hear a car coming. Noise will become a safety feature of brick-paved streets. The smoothness of an asphalt road surface makes a street very easy to plough after snowfall. But a standard snow plough does fine on a brick-paved surface if it has a rubber or polyurethane blade mounted on it, which prevents the plough from digging up individual bricks. These are used in frequently snowbound cities like Chicago and Montréal - or they wouldn't have brick paved streets like they do. For sidewalks, smaller snowblowers are already quite paver-friendly. All in all, brick or stone paving is the sustainable choice for streets. You don't need oil or oil products at all to build a good street, just a good team of bricklayers. Over the long term, brick paved streets are extremely budget-friendly. So push your town to switch away from asphalt: the benefits are many. But you don't have to wait for a whole town to make the switch: next time you need to re-surface your own driveway, consider re-paving it with a higher-albedo, higher-porosity alternative. It will be cooler around your house in summertime, and your garden soil will be grateful for the extra water. And you can make it as pretty as you want: there's an immense variety of pavers out there, your imagination is the limit. This is the real deal in curb appeal! Well that was a great post. I have to admit that I've never really thought about the materials used to make roads. Bricks look so nice. Asphalt, in addition to being a bad choice for the environment, is also, in my opinion, dangerous. I grew up in an area that used a lot of asphalt and when it would rain, the roads would get very slippery ... I suppose because water doesn't mix with oil so the rain would sit in a layer on top of the road causing dangerous road conditions. Thanks for a very informative article! I understand that not all asphalt is created equal. Where I live in the US, the road surface is very smooth (gives a very quiet ride). In the Netherlands it tends to be much rougher. That makes it more noisy, but the rough surface gives better traction in the kind of wet weather that visits that place all too often.